0115 8 244 244 or use the App. Track your cab on it's way to you and pay via the app. easy quick and accurate. We us the latest in booking systems, and transport technology to make us as efficient as it's possible. Meaning better prices and a better service for you. 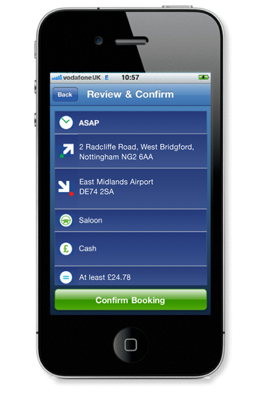 Book a Cloud Car by Phone, App or Online. • Enter your pick up location, destination and confirm. The latest GPS technology is employed to ensure our cars don't go further than they have to. It means we are very fuel efficient which is good for you (We're cheaper than the conventional alternative!) and it's good for the planet. Win - Win. The Software we uses enables car Journey Sharing' - If you agree, we can arrange to pick up additional passengers to make the journey as efficient and cost effective as possible.